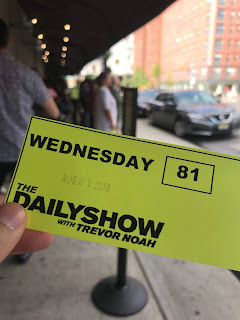 I recently went to The Daily Show with Trevor Noah after getting free tickets. As you can see on the ticket I went last week, so this is actually a relatively timely post! I'm getting better at this posting thing. 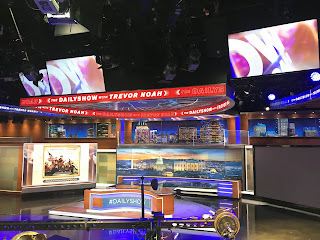 I was lucky enough to attend a taping of The Daily Show with Jon Stewart in 2014, too. The tickets are ALWAYS free! You can't buy tickets! If someone tries to sell them to you, don't do it! You won't be admitted. I got my tickets about a month in advance, maybe 6 weeks in advance, which is nice. 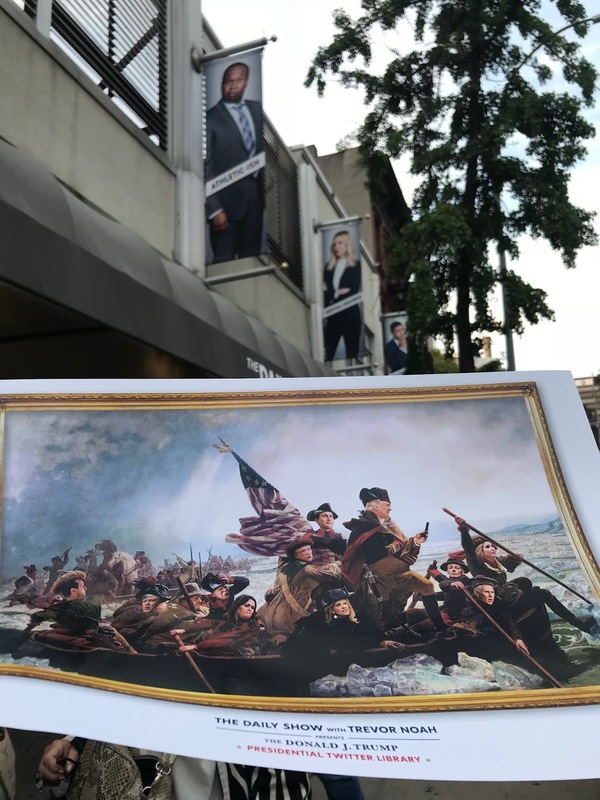 Unlike Last Week Tonight (this link goes to the ticketing page) tickets, they're released in batches and relatively far in advance, so if you're in NYC for a week, you have 4 chances. There are two different types of tickets. 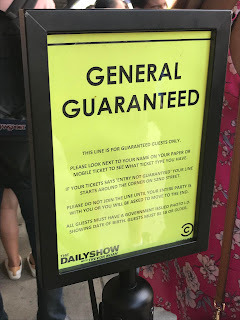 General Guaranteed - the type of ticket I got - and General NOT Guaranteed. General Guaranteed - You have to line up from 4PM. You MUST be lined up by 5PM otherwise you forfeit your spot. General NOT Guaranteed - This is first come, first serve. You queue in order of arrival, but it's not guaranteed that you'll get in the studio. 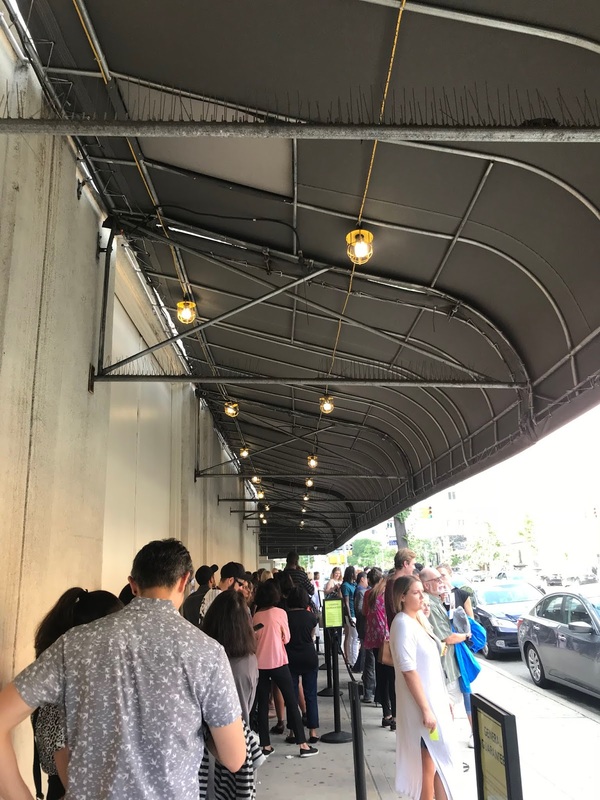 For this ticket type, you should probably get there at 4PM to be at the front of the line to increase your chances of getting in. You get the seats that had been reserved for people who had General Guaranteed and canceled or were no shows. 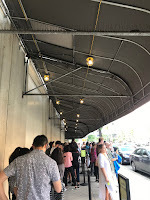 I think there are also some VIP sort of tickets, I'm not special enough to have experienced it, but each time I have been to a taping, people wearing suits and suit dresses have been let in earlier. I think it must be a group deal or something. TIP: If you want a better chance at sitting in the front row, you might want to come alone! The guy behind us in line was alone and they asked him if he wanted to sit in the front row! The General Guaranteed line starts at 4PM, but you can jump in line until 5PM. It's in front of the studio on 11th Ave, between 52 and 53. 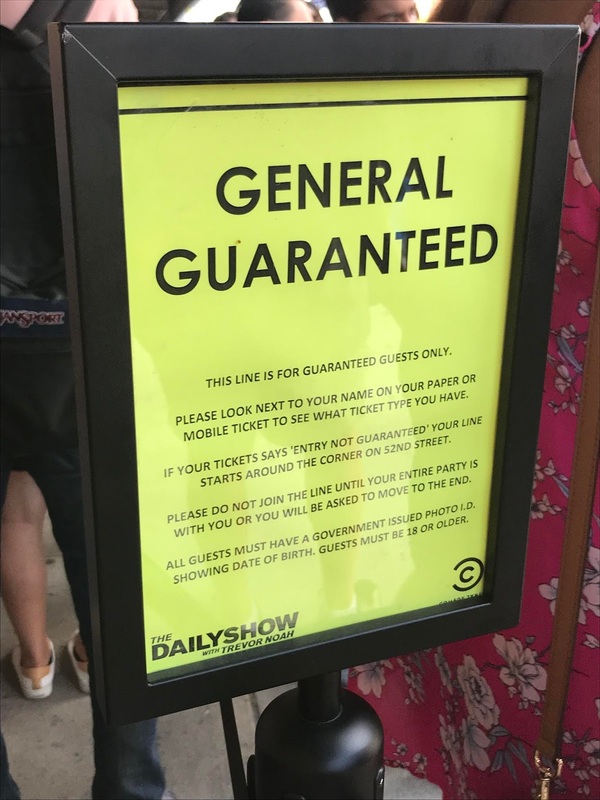 You must line up with your ENTIRE party, So, if you reserved 4 tickets, you have to show up with all 3 of your friends to check in and get in line. This is important to note in case you have a flaky friend who always runs late. Maybe tell him or her to show up 20 minutes earlier...like 3:30 or something. The line is OUTSIDE, so plan accordingly. There is an awning/overhang, but it's still probably not going to protect you from like blowing rain and other extreme weather. When you get there, you can easily spot staff members. They will be looking official and holding clipboards and headsets. You need to have the ticketholder go first, but the others must be right there. You have to show them your GOVERNMENT ISSUED PHOTO ID (ie. drivers license, government ID card, NYC ID, passport, etc.). Even if you're just tagging along and the reservation is not in your name, you STILL have to show your ID. To get tickets, you have to be 18 or older. In addition, they won't allow anyone younger than 18 into the studio for the taping. I assume they check your birthdate to make sure you're older than 18. They definitely check the name of the ticketholder against their ID. That brings me to the point from above! When you reserve a ticket on the website and receive them. The tickets WILL have your name printed on it. You can't transfer the ticket to anyone else. So, that brings up the point earlier of you CANNOT buy tickets to this show. If, for example, JANE DOE reserved tickets, but tries to sell them on Craigslist to JOHN TOURIST for $5. The ticket will still say JANE DOE's name on it. They won't be allowed in. We arrived around 4:40. So, we were relatively late in line. We were #81 and #82. They let you into the studio by number and you have to stay in line the entire time. So, if you arrive at 4PM and are #1. You'll be the first person in the studio. You'll also be standing around forever. Around 5PM they let the first group (#1-#60) in to use the bathroom. You are not allowed to get up and go out of the studio during the taping unless there's a major emergency. So, they recommend you use the restroom before going in. So, we were in the second group: #60-#100 (I believe, sorry I forgot..maybe it was #120). There was also a third group behind us, but I don't remember the numbers. By the time we were allowed to use the restroom, it was around 5:30 or so. By the time we made it into the security screening area, it was about 5:45PM. There's a metal detector like you see in schools and they also check your bags for any restricted items. If you have a large bag, including backpacks, they do take it and put it on a shelf for you to pick up after the taping. 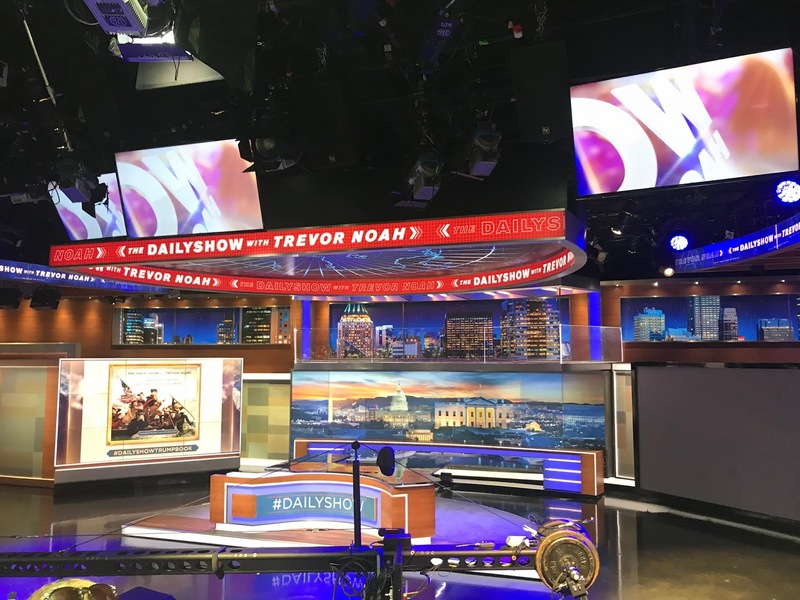 If you have Trevor Noah's book "Born A Crime" (buy here), you cannot get it signed during the taping. However, it kind of sounded like they'll take it and then get it signed and send it back, but that's just my assumption. The security guard said that they'll "take the book for you." Honestly, I never thought about doing that and I'm kind of jealous people did. I read the book last year or the year before and it was a great read! I learned so much about South African apartheid. They also don't really allow food, drink, or gum into the taping, so they may ask you to throw it away or put it in your purse. You'll get into the studio in order by number. So, we were on the right side of audience and about 4 rows back, just so you get a sense about where #81 gets you. The lower the number, obviously, the closer you are to the front. From who I saw in the "not guaranteed line," it seems like they get filled in on the WAY side. So, I feel like if you're in the first 20 or so "not guaranteeds" you'll get into the studio, but don't quote me on that. You'll sit around for a while. This is the only time you can take pictures! You should not take pictures are you're filing in. If you take pictures during the taping, I believe it when they say they'll confiscate your phone and make you delete any pictures! So, we got in around 5:50 or so. After everyone has filed in, maybe around 6:05, the supervisor comes out and does a speech about what is/is not allowed. After a rather long wait, they will play a highlight reel of all the best clips. At that point, you have to put your phones and cameras away. Then, around 6:30 or so (ballparking since I didn't wear a watch and didn't have access to my phone), the opening stand-up comedian guy comes out to try and pump up the audience. He does his bit...the jokes are about what you'd expect from a standup show, for about 10-15 minutes. Then, they'll give you some more instruction. Around 7PM, Trevor Noah will come out. Maybe it's just our show, but this is how it was a little different from when I was at the Jon Stewart taping. Jon Stewart had done some Q&A from the audience. There wasn't a Q&A portion during the taping I attended. He'll do his show straight through. He really does notice the audience. In the show that I attended, the lady he calls out for laughing too hard at the airport security joke was sitting in front of me: You can watch it here on Comedy Central August 1 2018 Show, if you want to just watch the clip I'm talking about it's here on YouTube. He really meant it, too. He talked to us in the audience about the lady and looked in her direction during the commercial break 😂. I was slightly mortified that maybe somehow he could only see my face, but I am pretty sure that's not how lighting works in television studios (if I'm wrong, please let me live in my fantasy world). They tell you that taping will end around 7:30 or 8PM. For us, it was almost exactly 8PM when we got out of the studio (I just checked a text message I sent). The Donald J. Trump Presidential Twitter Library. It was literally released a day before the show we attended. 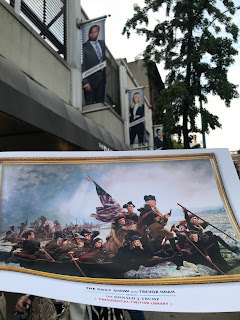 I just flipped through some of the pages that are available on Amazon and it actually seems kind of good, even though I'm not really into political humor. If you have any questions, leave a comment below! I'll try to help you out from my experience. If you do get tickets, let me know below and I'll be sure to tune in to watch your episode.